Nypol RX 25/2 is a special polymer modified binder used in hot mix asphalt applications where there is a minimum requirement of using 20% reclaimed asphalt. The A1 is one of the most important motorways in Germany. It links Saarbrücken with the Ruhr area and its harbours at Bremen, Hamburg and Lübeck. The motorway is used by 68,000 vehicles a day and is a key route for heavy goods vehicles. A small section is currently being rebuilt. The motorway is being widened from dual two lane to dual three lane carriageway over a 9.4km length between Lohne/Dinklage and Vechta. The client asked that the road be widened with the minimum possible disruption to traffic, using a durable asphalt material. A polymer modified bitumen known as Nypol RX 25/2 has been specified for the binder layers of the road, to allow for at least 20% Reclaimed Asphalt Pavement (RAP) to be included in the asphalt specification. The Stone Mastic Asphalt top layer is bound with Nynas Endura Z2, a 'Premium' polymer modified bitumen used in high performance hot mixes. It has excellent 'workability' due, in part, to the inclusion of additional viscosity reducing additives. The product strikes a good balance between resistance against permanent deformation and flexibility, and is suitable for asphalt layers with very high static and dynamic loadings. The roadworks site is 9.4km long and has a total surface area of 141,000m2 on each carriageway. Widening took place on one side of the road between June and December 2008 to provide a 3.75m wide truck lane, two additional lanes of 3.5m width and a hard shoulder of 2.5m. The total width of the asphalt pavement is 14.5m. The site is located between the intersection of Lohne/Dinklage and Vechta and includes two parking areas. The opposite carriageway was upgraded during 2009. Extensive research into the correct asphalt mix to use was carried out by the Ingenieurgesellschaft für Technische Analytik mbH (IFTA). The sub base of the road is made up of a 500mm thick layer of aggregates, bonded with 4% to 5% of emulsion and between 1% and 3.5% of cement. An asphalt pavement was then built on top of the sub base. The asphalt pavement consists of a 140mm base layer (AC 32 T S), an 80mm asphalt binder (AC 22 B S made with Nypol RX 25/2 containing 20% RAP) and a 40mm surface layer (SMA 11 S with Nynas Endura Z2). This top layer of asphalt is placed by two pavers, working in tandem, to cover the full 14.5m carriageway width in one pass. Two shuttle buggies were used to ensure the pavers kept moving. This Premium polymer modified binder contains additives that improve workability and a specially selected bitumen suitable for heavily loaded areas, such as container terminals, bus stations and industrial areas. This is a relatively hard binder, with a penetration value of 25, that can be mixed and laid at normal asphalt temperatures of between 150 -170 ºC. Nypol RX 25/2 is another polymer modified product made with a bitumen that contains 'rejuvenating' properties. It has an increased polymer content to enhance an asphalt mix made with RAP. The binder's polymer content is such that the properties of the asphalt mix meet the specifications for a mix made with virgin aggregates and bitumen that meets the PMB 45 class specification as used in Germany. These highly specialised bitumens with improved workability, have shown their versatility in both large projects such as container terminals, and smaller projects, such at bus stations and in the refurbishment of Oxford Street and Regent Street in central London. In general a wide window of workability is needed for successful highway works, because unforeseen situations can arise when it is not possible to work under optimal laying and compacting conditions. In addition, under such circumstances an ideal binder should provide a 'forgiving nature'. These performance characteristics proved to be useful during the widening of the A1 in Germany in 2008 and 2009, especially when circumstances were less than favourable to asphalting. 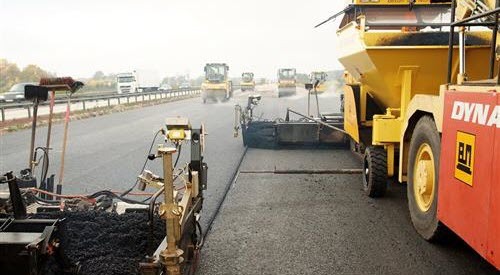 Use of the most advanced asphalt materials allows a 'high tech' and long life motorway to be constructed. The advantages of asphalt have been known for decades and during this time it has been proven that asphalt has no problem competing with alternative materials., allowing construction to take place in a reasonably short period of time, with minimal disruption to traffic flows. A motorway with a top layer, supported by a solid high quality binder layer, will ensure maximum performance under heavy traffic. Motorways built using asphalt tend to feature lower layers that can support several renewals of the top layer. In other words, motorways built using asphalt last for many decades. Download this information on how Nynas Endura Z2 / Nypol RX 25/2 was used at A1 Motorway between Osnabruck and Bremen, Germany, as pdf.